So a natural question arises: what single penny configurations can be achieved from that starting position? As every move in Nuclear Pennies is reversible, if you solved the puzzle you know we can shift a single penny 6 places left or right. (But to move 6 spaces left we need one extra space on the left.) So labelling positions 0,1,2,... we know that starting from 7 we can place a penny on 6n+1 for all non-negative n. But what about other positions? We can borrow a technique from M Reiss's seminal paper on peg solitaire: Beiträge zur Theorie des Solitär-Spiels, Crelles Journal 54 (1857) 344-379. The idea is to associate an algebraic value with each position and then ensure that each this is chosen so that each legal move leaves the value unchanged. Now consider the values of 1,x,x2,... and so on. It's not hard to show that the only time an element in this sequence takes the value 1 is when the exponent is 6. In fact, x is a sixth root of unity. So this shows we can never shift a single coin by anything other than a multiple of 6 sites. As the video shows how to shift by 6 sites we know we can shift a single coin by n sites if and only if n is a multiple of 6 (and there's one site available to the left of the leftmost penny). It's neat that we took an excursion through the field of complex numbers to prove something about a seemingly simple piece of discrete mathematics. But who cares about nuclear coin reactions? That's not my real motivation here. Believe it or not, each coin shuffle above corresponds to an isomorphism between certain types and solving the puzzle above actually demonstrates a really neat isomorphism between tuples of data structures. T is a simple binary tree type. That declaration simply says that in the algebra of types, T=T2+1. Now unlike complex numbers, when you form a polynomial in the type T you can't have anything other than a non-negative integer as a coefficient. In other words, positions in the game of Nuclear Pennies correspond precisely to polynomials, in the algebra of types, in T.
And associativity the other way. Here I'm starting a convention of using primes to represent the inverse of a function. I'm going to need all these. And now we need functions to assemble and disassemble trees at the start of a tuple. These correspond to fusion and fission respectively in the game. Here's the first step in the solution. That was easy. We're going to use a few functions whose sole purposes is to shuffle around type additions using commutativity and associativity. > iso = step20 . step19 . step18 . step17 . step16 . step15 . shuffle5 . shuffle4 . step14 . >     step13 . step12 . step11 . shuffle3 . step10 . step9 . step8 . step7 . > iso' = step1' . step2' . step3' . step4' . >     step5' . step6' . shuffle1' . shuffle2' . step7' . >     step8' . step9' . step10' . shuffle3' . step11' . >     step12' . step13' . step14' . shuffle4' . shuffle5' . Enough already! Time to test the code. It's already pretty obvious that each of the steps above is invertible but let's use QuickCheck anyway. And here's a small puzzle: why to I have return Leaf twice? So time to think about what exactly we have here. We have a way to pack 7-tuples of trees into a single tree exactly. It's easy to store two trees in a tree say, just by making them the left and right branch of another tree. But then we get some 'wastage' because the isolated leaf doesn't correspond to any pair of trees. We have a perfect packing. Of course the set of trees and the set of 7-tuples of trees have the same cardinality, and it's not hard to find a bijection by enumerating these sets and laying them out side by side. But such a bijection could get arbitrarily complicated. But the isomorphism above only looks at the tops of the trees and can be executed lazily. It's a particularly nice isomorphism. And from what I showed above, you can only pack (6n+1)-tuples into a single tree. Weird eh? And everything I say here is derived from the amazing paper Seven Trees in One by Andreas Blass. I've mentioned it a few times before but I've been meaning to implement the isomorphism explicitly for ages. Blass's paper also shows that you can, to some extent, argue paralegal ⇒ legal - something that's far from obvious. This was going to be part two of three, but I'm now squashing two parts down to this one article. So this is the conclusion to what I started in my previous installment. Previously I talked about certain things you could do with types built up recursively using addition and multiplication of types - the so-called regular tree types. But I didn't talk about types that could be built using ->, ie. function types. These types seem somehow different. The type Either a b contains data pertaining to an a or a b, and (a,b) contains data about an a and a b. But a -> b is something completely different, a function rather than a datastructure. What I want to show is that this distinction isn't so clear, and that in fact functions can often be replaced by an isomorphic datastructure. There's an obvious application for this: memoisation, and most of what I say can be found in a paper by Ralf Hinze on that subject. However, I have an ulterior motive - computing generalised antidiagonals, and my notation will be biased accordingly. Firstly, I'll be using conventional mathematical exponentiation notation for function types, so I'll use AB to mean the same thing as B -> A, ie. functions mapping from B to A. This will help to make some of the algebra seem more natural. So let's start with a type like A -> (). We could also write this as 1A. From ordinary algebra we might expect this to equal 1. Sure enough, there is (up to pointwise equality) only one function of type A -> (), and it's called const (). tabulate converts a function into a datastructure and apply performs the opposite. So let's use the same example as in my previous installment, Bool. which automatically converts functions into a memoised form. Next consider products. This is slightly subtler, but only slightly. We use ABC=(AC)B. If we define U[X]=XB and V[X]=XC then ABC=U[V[A]]. Note how once you've used ack' on some arguments, it runs instantly when you reuse it on the same or smaller arguments. Tries are containers. So suppose T is the trie corresponding to the type X with T[A] isomorphic to AX. What is T? Well it's just 1X which from basic algebra equals 1. Or do look at it another way, it's the type of all functions taking values in the type 1. There's only one such function and so clearly there is a unique object of type T and T must be isomorphic to 1. An element of '1' can be thought of as a type with no information in it. So if we have a container with elements of 1 in it, it's as if the slots for those elements have simply been closed off. So another way to look at T is that it is a container with all of its slots closed. So for tries, T must be equivalent to the trivial type 1. At this point, derivatives of containers have become mainstream. So I don't need to talk about this and can direct you to the Haskell wikibook if you need to brush up. So what do we get if we differentiate the trie T? T is a container that holds one value for each element of X. The derivative, T', is a trie with a 'hole' in it. In other words, it's a container that contains a value for all elements of X but one. So what's T'? All of the slots in the container have been stuffed with 1 and so are effectively 'closed'. But the hole is still there and the whole hasn't been 'closed'. So a T' is a trie where one slot has been singled out as a hole. But the slots are in one-to-one correspondence with elements of X, and so T'=X. There's another way to see this. Define the function on the reals t(y)=yx. Then t'(y)=xyx-1 so t'(1)=x. So it should come as no surprise that T'=X. See the Container Types blog for more dicussion of this. They call F' by the name log F. Their Y can be seen as the operator that maps a type to its trie. Now, let's go back to the antidiagonal again. I showed how to compute X2, but you can see that it's tricky to use the same approach to extend this to Xn, for arbitrary naturals n. Instead, consider differentiating T' to make another hole in the trie. T''[X] must be a trie of X's with two holes, but the second hole obviously can't be where the first hole was. So T'' is a datastructure that consists of nothing but two distinct holes in a T. As if by magic, T'' must be X2. There's another way to see this. If t(y)=yx, then t''(y)=x(x-1)yx-2 so t''(1)=x2. And more generally, T(n)=Xn. And that's the solution! Let me at least do the algebra for simple binary trees. Let T be the trie of B so T[X] is isomorphic to XB. (Exercise: try to draw a picture of this kind of tree. Because of the nesting of T's it's not a 'regular' type and you'll find yourself rapidly needing a lot of paper!). You can think of differentiation as annihilating an element of a container, leaving only a hole as the 'trace' that it was there before. So it's pretty weird that annihilating a 1 from a T actually creates an X. It's almost as if T is some kind of vacuum and X is an anti-particle. Weirder still, when we do this twice we get two distinct X's. So it's as if T is some kind of vacuum for fermionic X's. This isn't completely insane. In quantum field theory we use differential operators to create and annihilate particles. I haven't written the code, but it ought to be possible to go further and define Xn/n! for instances of Ord. This is the type of n-tuples where the elements are distinct and in order. I expect you can construct this using a similar recursive technique to the way I built up the antidiagonal. Also, many identities satisfied by falling factorial should correspond to isomorphisms implementable in Haskell. And I'm sure there must be an Umbral Calculus connection. And an important final note: X -> X2 is not a functor. So don't even think about differentiating it. Changed my mind. Here's some code for implementing X2/2!. Call the set of pairs (a,a') with a<a' the subdiagonal. An element of (a,a) either has a lower first element, a lower second element, or the two elements are equal. This is expressed in the type Pair below. Spans of values that are the same in both lists are represented with just one set of values. Individual differences are flagged as such. And of course the whole thing works recursively if you have lists of lists as in the last quickCheck example above. Can you define the type of unordered binary trees? An unordered binary tree is either the empty tree, or an unordered pair of unordered binary trees. I'd like to say T=1+T(T+1)/2 = 1+T+T2, but those can't be turned directly into a valid definition is Haskell. I don't know if there's a solution. In a programming language with constrained types we can construct a type like "the type of pairs of X's where the two X's are distinct". But can we make such a type in Haskell? Answering this question will take us on a long journey which I think I'm going to split over three parts. And as usual, just put this blog post into a file called main.lhs and you can run it with ghci -fglasgow-exts -fallow-undecidable-instances. The idea is that the = sign is an isomorphism with the property that the diagonal in X2, ie. elements of the form (x,x), get mapped to the right component of U+X. When we are able to do this, we'll call U the antidiagonal of X, and say that X is splittable. It's not hard to check that twine and untwine are mutual inverses and that twine . diagonal=Left. You can view this as a special case of 22=2+2 as 2 is essentially a synonym for Bool. This certainly has some of the properties you might expect of Bool-1, such as having only one instance. But it's not very natural. How should we embed this type back in Bool? There are two obvious ways of doing it and neither stands out as better than the other, and neither is a natural choice. But what we've shown above is that there is a natural way to subtract X from X2 because a copy of X appears naturally in X2 as the diagonal. So the question is, can we extend this notion to types beyond Bool? In any commutative semiring fix a and b. If the equation a2=u+a has a solution, and the equation b2=v+b has a solution, then the equations (a+b)2=x+(a+b) and (ab)2=y+ab also have solutions. So if some types are splittable, so are their sums and products. As types form a commutative semiring we see that this theorem, twined with 12=1+0 allows us to form "X(X-1)" for any type X built purely using non-recursive Haskell data declarations. In fact, we can use the above theorem to define "X(X-1)" for types, and use the notation X2 for this. (I hope your browser shows that the exponent here is underlined.) There's a reason I use this notation which I'll get to later. So (a+b)2=a2+b2+2ab and (ab)2=ab2+ba2+a2b2. 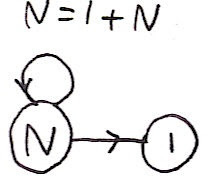 We can describe such paths by the number of loops taken at M, the number of loops taken at N, and a Bool specifying whether we took path 0 or 1 from state 2 to state N. In other words, M is much the same thing as (Bool,Natural,Natural) above! M is a kind of 'compressed' version of a pair of N's. Suppose we want to twine S (S (S Zero)) and S (S (S (S Zero))). Both of these share a S (S (S _)) part. What the type M does is allow you to factor out this part (that's the part that goes into Loop) and the remainder is stored in the Finish part, with a boolean specifying whether it was the first or second natural that terminated first. Let's step back or a second. Earlier I showed how for any type X, built from addition, multiplication and 1, we could form X2. Now we've gone better, we can now form X2 even for recursive types. (At least for data, not codata.) We haven't defined subtraction in general, but we have shown how to form X(X-1) in a meaningful way. 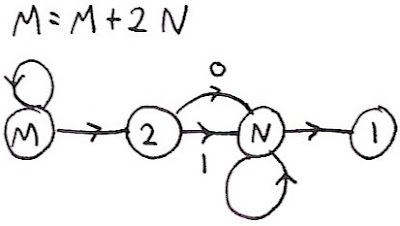 This looks pretty hairy, but it's really just a slight extension of the M=M+2N example. What's happening is that if two lists have the same prefix, then SharedList makes that sharing explicit. In other words this type implements a form of compression by factoring out shared prefixes. Unfortunately it took a bit of work to code that up. However, if we were programming in generic Haskell, the above would come absolutely for free once we'd defined how to handle addition and multiplication of types. What's more, it doesn't stop with lists. If you try it with trees you automatically get factoring of common subtrees and it works with any other datatype you can build from a Haskell data declaration (that doesn't use builtin primitive types like Int or Double). (2) There are more efficient ways to define the naturals than through the successor function. Can you come up with a more efficient binary scheme and then code up its antidiagonal? (3) The antidiagonal of the integers can be approximated by (Integer,Integer). This seems a bit useless - after all, the whole point of what I've written above is to split this up. But we can use this approximation to construct approximations of other types where you do get a payoff. Implement an approximation to [Integer]2 this way so that you still get the benefit of prefix sharing. This looks a lot like traditional tries.